Despite a low dividend, Citigroup is spending billions on buybacks. Through the first quarter of 2016, Citigroup (NYSE:C) has bought back 117 million shares, which is more than 4% of the current outstanding total. Even though the company has spent more than $5 billion on buybacks, shareholders are paid a paltry dividend yield of just 1.2%. However, while this may seem strange at first, it's a great move for investors. This may seem unfair to dividend investors. After all, the company's $0.64 annual dividend rate translates to a yield of just 1.2% at the current share price. It's clear that Citigroup has chosen to prioritize buybacks to dividends, and there's a good reason for this. In a nutshell, Citigroup investors should be thrilled about this because of the stock's low valuation. As of the end of the third quarter, Citigroup's book value was $74.51 per share. 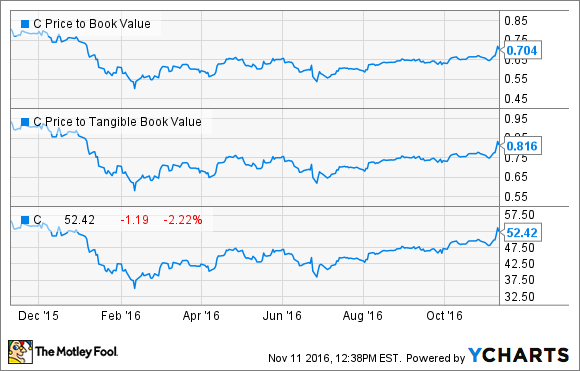 Even when you exclude intangible assets, the company's tangible book value was $64.71. To make the situation even better, you'll notice in the chart that Citigroup has been trading for significantly less for most of 2016, while these buybacks were taking place. In fact, based on the buyback information in each of Citigroup's three quarterly reports so far this year, the average price the company paid for one of its shares is just over $45. Now, it's important to mention that Citigroup is cheap for a reason. It's a relatively risky bank that hasn't done a great job of generating acceptable profitability in recent years. This is by no means a low-risk stock. Even so, it's tough to take issue with the instant value creation that results from large buybacks of cheap stock. If Citigroup rises dramatically, management's capital-returning strategy might change, but for now, investors should be happy that the company is maximizing shareholder value by repurchasing billions of dollars of stock.